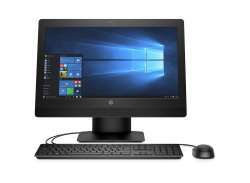 HP ProOne 600 G3 2XG30PA Desktop Designed for business, the HP ProOne 600 AiO features flexible deployment and connectivity options, strong security, and comprehensive manageability features in a sleek and stylish chassis. Featuring extensive cable management and sleek design, this AiO suits the front desk or an executive’s office. The virtual edge-to-edge glass on the 21.5 diagonal IPS display provides plenty of workspace.